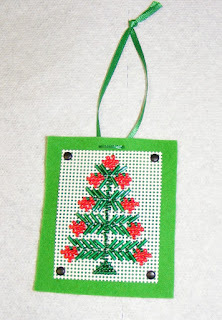 My good friend Sandra reads my blog and noticed I needed a picture of the ornament I sent her. So she sent me this today and I am posting it here. I think this finishes up the Christmas Ornament Parade of 2010. Mill Hill beaded ornamen kit on perforated paper. I used black brads to attach it to wool felt and added a ribbon hanger. I love the use of brads in your finishing! Great idea!